This Natural Lokta Batik Paper is hand-made through a lengthy wax layering process resulting in vibrant colors and one-of-a-kind designs. Hand-placed beeswax creates random splatter designs and patterns on the natural background of the paper. Once the dye has fully dried, the wax is removed in a multi-step ironing process returning the Batik Paper to its natural Lokta texture. 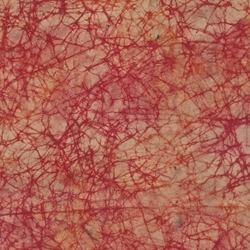 This fun lokta paper sports red and orange veins of color on a natural colored base. Batik Lokta Paper is extremely durable and versatile. Use it in bookbinding, interior design, collage, origami and many other paper craft projects. *Image used with permission from Jean DeAngelis. 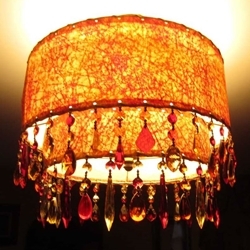 Jean DeAngelis used the Vein Batik Lokta Paper to refinish old lampshades in a Vacationhouse Bed and Breakfast.